Thanksgiving is on Thursday and Black Friday week is upon us folks! However, I don't want to Kayne West your Thanksgiving. I want you to finish your Turkey Day with your family and hope you enjoy the heck out of it. Eat ALL the turkey, the green bean casserole (hands down my favorite), drink the wine, and have peaceful conversations with your relatives about the recent election. If it doesn't go peacefully, turn on some Adele like they did on that SNL skit last year. When you wake up with that turkey and wine hangover Friday morning we will have kicked off the holiday shopping weekend with some great deals for you! I'm not keeping these a secret so here are the details below. 20% off our Sterling Silver Evil Eye necklace with black diamond. Good vibes only. Am I right? Live in Kansas City? Cool! Me too. I will be at Coveted Home on the Country Club plaza from 10:00 AM - 5:00 PM for a trunk show. I will be offering 20% off the Arrowhead Earrings and the Bluestem Bracelet. These offers are only valid in store so get out and support local businesses! Did I mention we will be serving boozy punch? Oh, you didn't think we would leave all of you online shoppers out did you? 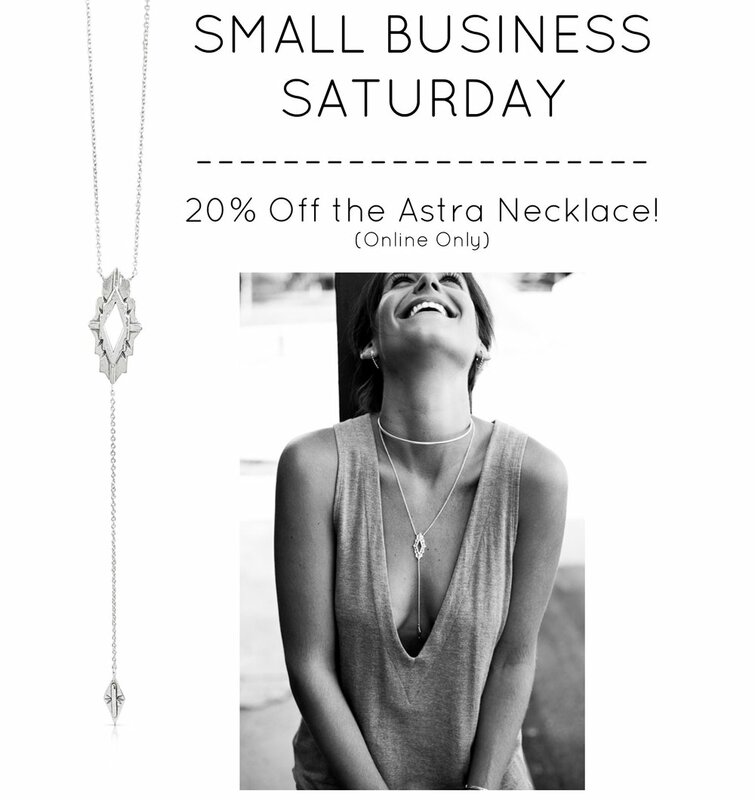 We want to give a little love to those of you who have been coveting our Astra Necklace. It will be 20% off. All day. Give Thanks. Brunch hard. Rake the leaves. Kick your feet up girl. How about 20% off our Mariposa Earrings in your choice of Sterling Silver or 14K Gold Vermeil. Seriously folks, have a great Thanksgiving. You can find me housing the green bean casserole . We have a lot to be thankful for here at Sierra Winter Jewelry. You have been great to us. THANK YOU!